- - -Waterfront property, just fifty years ago, was considered unappealing and suitable only for commercial purposes. Then a revolution of thought took place. Suddenly, waterfront wasn't seen as run-down, mosquito-ridden, and vulnerable to cold winter winds and storms. It became THE place to live, work, and have rejuvenated tourist-oriented businesses. Communities used urban development money and rebuilt and revitalized their harbors and waterfront areas. Perhaps nowhere has this been more evident than along the 524-mile New York State Canal System. What had been an unbearable passage for pleasure boats became one of the most desirable inland cruising passages in the world. --- -It was like living by the railroad tracks -- not the most desirable property in town. It was a commercial transportation corridor in your backyard. Hundreds of strangers passed by your door every day, some raucous and drunken. A hub of commerce is not necessarily a thing of beauty, nor was it meant to be. The Erie Canal was developed by New York State in the early 1800's as a commercial transportation route for agricultural and commercial shipping, not for graceful sloops. --- -The canal was a hugge success. Soon the state was sponsoring canal links to all its far corners. Six new laterals were built within a decade of the opening of the Erie Canal, and four more in the next four years. -- to Lake Champlain, the Finger Lakes, and Lake Ontario. 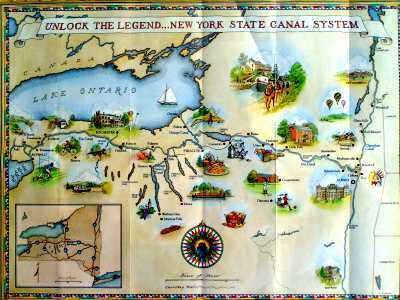 Not all remained commercial successes -- only three are in use today -- <the Champlain, Seneca-Cayuga, and Oswego Canals. Natural waterways, such as Lake Champlain and the Hudson River, had new docks built to link lake and river commerce with the canal system, resulting in a system today of well over 500 miles. --- -By 1862, 'improvements' had been made to the canal -- it was deepened from four feet to seven, and barges could then carry 240 tons of produce compared with the original 30 tons. 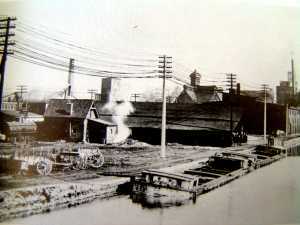 In 1882, tolls were taken off the canal. --- -In 1903, it was decided to again improve the newly named 'Barge Canal.' The Barge Canal was over 10 times longer than the Panama Canal and was considered the world's greatest waterway system. It was improved to a depth of 12 feet with a width of 75 feet and had 57 locks, built of concrete and operated by electricity. Barges with a capacity of 650 tons, were linked into fleets of four with one being self-propelled. Other, even larger, barges were rafted into a fleet of five and pulled by a tow. It was a new century and a new era for the canal. Mules and tow paths were memories as carriers became self-propelled. --- ---- -Railroads, some paralleling the Erie Canal, carried passengers -- the packet boats were simply too slow for the new century. My great grandfather went west as a child on a packet boat; a hundred years later, I went west as a child on the New York Central's 20th Century Limited. Barges could still compete with rail carrying bulk produce with no time deadlines. But, slowly the barge traffic declined, losing to trucks and trains. --- -During World War II, the barge canal carried increased loads of bulk materials as the railroads carried time-essential war goods and troops. But, after the war, there was a rapid decline in barge traffic. Self-propelled barges and tows were restricted to a 10 mph speed to protect the banks of the canal from wake erosion. Trucks and trains could compete with barges in the profit world of time/weight/expense, and soon there were few barges plying the slowly deteriorating canal. 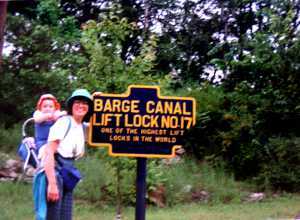 When we cruised the canal in 1992, locks were leaking, lock walls were deeply eroded and rough, and docks for transient boaters were few and in bad shape. Talk we heard along the canal then was that it was soon to be abandoned and we would probably be among the last boats in the last year of the canal. --- -Fortunately, even as we cruised the canal, policy makers in Albany were discussing the future of the canal. They noted the increase in pleasure boat travel even as commercial traffic declined. 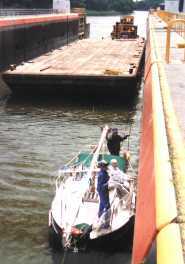 In 1993, the lock at Newark locked 235 recreational boats per summer month and 27 commercial boats. --- -In 1992, the state legislature created the Canalway Recreation Commission to develop a long-range master plan for both on-the-water and canalside users. The Barge Canal was renamed the NY State Canal System, and the operation and maintenance of the canal was moved from the Department of Transportation to the NY State Canal Corporation, a newly created subsidiary of the NY State Thruway Authority. After 100 years, tolls were reinstated to supplement the $50 million per year budget. --- -The comprehensive NY State Recreationway Plan was proposed in 1995. It recognized the importance of tourism and pleasure boats("recreational boating ... its most important asset") for the economic development of a region that had been slowly decaying with the loss of canal commerce. The plan determined boaters spend more per capita than landside users, and required more facilities. --- -The Plan advised increased spending in the 234 towns on or near the waterway to rectify "gaps in services." It advised the creation of seven major "gateway destinations," to be spaced about 35 miles apart, the distance a boat can reasonably travel in a day. These Gateways (Whitehall, Waterford, Little Falls, Seneca Falls, Oswego, Rochester and the Tonawandas) were to be major harbors with significant waterfront redevelopment projects, funded primarily by the state. These would include all boating services, visitor centers, and developed historical attractions. It also identified ninety "service ports" -- smaller facilities with transient tie-up spots, picnic grounds or campsites, often associated with lock sites and targeting trailer boats. The service ports receive some financial and technical assistance from the state, but most of the development is by local towns and communities. --- -The Legislature accepted the Plan, and in 1995 Governor George Pataki authorized the spending of $32 million for Phase One of the redevelopment. Today, all gateway destinations and nearly half of the ninety service ports have been completed and are a great success. 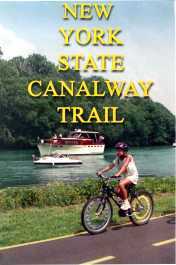 --- -In 2000, the US Congress designated the waterway "the Erie Canalway National Heritage Corridor." This designation will coordinate federal efforts for preservation and renewal. --- -Phase Two, authorized in 2002 for $50 million, has $15 intended for the completion of post projects and boating amenities. The remaining $35 is primarily for the completion of the Erie Canalway Trail -- a 348-mile multipurpose path from Lake Erie to the Hudson River. The Trail is now nearing completion. When finished it will be be the longest multi-use trail in the US. It will be used for cycling, hiking, horseback riding, snowmobiling, and cross-country skiing. The Trail will be managed by various municipalities and maintained by a partnership with state and local governments and volunteers. There is an Inn-to-Inn program for those who wish to travel the trail and stay in Inns a day apart. --- -The canals have also had lock rehabilitation, spillway repairs, and bank stabilization. To date $215 million has been spent or appropriated for these improvements. Our boat no longer scratched its way up the decayed walls of a flooding lock. --- - State funding has recently been reduced due to budget constraints, but with the understanding that recreational boaters will remain the future of the canal. Tourism will continue to be the economic base for this whole part of the state. --- -Many towns now have boater-friendly town initiatives. These include safe, reliable town access and, in many communities, free facilities for boaters (overnight docking with water, electricity, and pump outs) . The annual season for canal use has been extended several weeks, there are longer daily summer operating hours at locks, and there is an 800 number for canal-related information. In addition to the daily pass, there are now multi-day vacation passes at a reasonable toll. --- -Some towns have unique initiatives. For instance, Newark, one of our favorite towns, was one of the first communities to develop their waterfront for pleasure boats. There are docks on both sides of the canal, a manned interpretive center, book swap, restrooms, shower and laundry facilities. 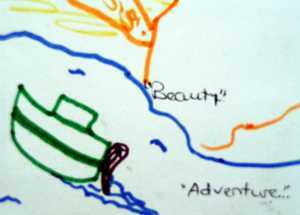 Phoenix has the "Bridge Town Brats," kids 9-16 who help tie up boats, deliver dinners, and run errands for boaters. The mayor of Ilion, NY sometimes visits boaters at the docks. Restaurants and food markets often send a car, no charge, to pick up and drop off boaters. Canal towns now have dozens of festivals, rallies, musical groups -- even movies in the park. They sponsor tours of museums and historic sites. --- -A hundred years ago, mules pulled barges and packet boats along the towpath. Today, travelers on the towpath wear hiking boots or pedal bikes. Those traveling on the canal, paddling or piloting their craft, are often on a family vacation. Once a thoroughfare of commerce, today it is one of the finest recreation resources in the US.